The 32" Sleeping Tray is the #1 cat tree in this category. This mid-sized sleeper can be customized with sisal on one or both legs. Back leg is braced to add strength and stability. The large tray 20"x12"x3" will accommodate many friends and toys. 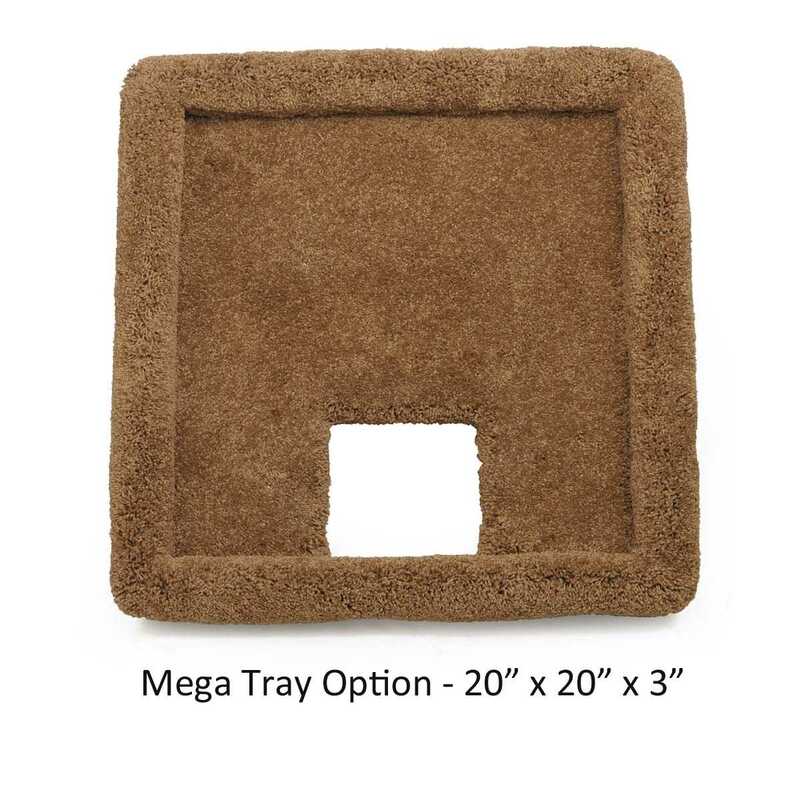 We also offer a Mega-Tray for your top sleeping tray and it is 20"x20"x3"! This sturdy tree has been built for cats jumping on and launching from. The large wobble-free base is 20"x20", the perfect height for under a window. You can optionally add sisal rope to one or both legs. Shown with one leg in sisal. 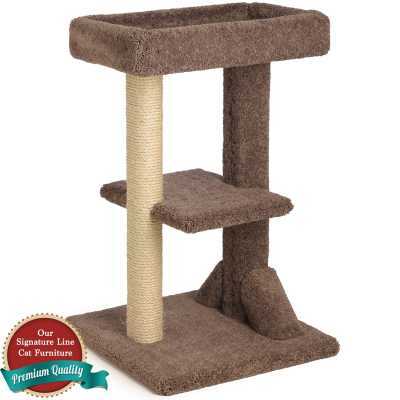 Our Signature Cat Furniture line is our highest quality, premiere cat furniture offering. The best cat furniture that you can buy - built to last for years to come. The CatsPlay Signature Line of Cat Furniture is completely made to order; you choose the color, size and optional features. Match your home's decor and give your cat the gift of a solid, comfortable home to call their own. The Signature Line is covered in high quality residential-grade carpeting in your choice of colors. Check our color chart to view the available color families. Note, carpet colors will vary slightly. Buy confidently, knowing that our CatsPlay Signature Line Cat furniture contains no MDF or particle board. It is constructed with sturdy, solid wood and will last for many years. Its quality is abundantly greater than much of the common cat furniture on the market today. On many of our CatsPlay Signature Cat Furniture pieces, you will be provided the option to provide enriching features for your cat - such as the additional of sisal rope scratching areas on one or more posts or legs. We use only quality, natural unoiled sisal rope that contains no toxic materials. You may also add optional mice toys to hang on your cat tree! Each piece in the CatsPlay Signature Line of Cat Furniture is built by hand by our team of furniture builders here in Santa Cruz, California. Each of our team members has more than 30 years of experience constructing cat furniture, and have built and shipped tens of thousands of cat trees, gyms, condos and scratching posts to happy cats around the world. Minor assembly will be required, and full instructions will be provided. Your order will leave our warehouse and be on its way to you within a two weeks of the date that you place your order! To speed up the process of building your order, please select a first and second choice for carpet colors. Remember, the shades of carpet may vary from what is shown here for a variety of reasons. We will do our best to match the carpet you get with the colors you choose. If you have no 2nd choice , please choose the same color for both 1st and 2nd choice!